Where to start? Marshmallows I love eating them and most of all I love them melted on top of a mug of hot chocolate. However, I will confess to having never made them myself. So when I was asked if I would like to review Marshmallow Madness! by Shauna Sever published by Quirk Books I jumped at the chance. This book has been something of a revelation for me, I have always admired marshmallows made by fellow bloggers but I have never really paid that much attention to the recipes. For some bizarre reason I have always thought they were made using egg whites. So I now find it amazing that sugar, water, gelatin, heat and golden syrup creates amazing white clouds of fluffiness. I put the book to use by making Classic Vanilla Marshmallows, which I found amazingly easy to make. Although I did have a moment when adding the hot syrup that it all may go wrong, but I need not have doubted myself. I only have an electric hand mixer, and you really do need a stand mixer as you really do need every hand you have to make marshmallows. I did wonder if my little hand mixer would last the distance! The book itself is almost like a marshmallow it has a puffy like cover, very tactile indeed. There are some wonderful photographs, the clever use of shapes and colours in the marshmallows makes them fun for all to make and eat. There is a great section called Happy Hour which shows how you can include alcohol into your marshmallows to give them a cocktail feel. It is filled with very creative marshmallow recipes, not just limited to using them in drinks, recipes that involve the use of marshmallows in sweet treats and cookies. So do not be fooled into thinking this book is all about marshmallow. What I'd like more or less of? This book is by an American baker and as such all the measurements are in cups, a conversation table would of been useful. I have a lovely set of measuring cups, so this was not a hindrance for me. If you were to by the book as a gift you may want to include a nice set of measuring cups too. 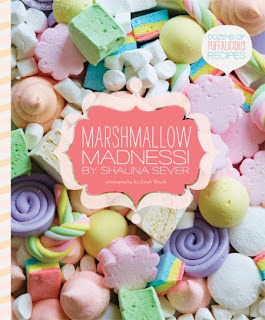 Marshmallow Madness is available to buy online, for more information about PGUK Books follow them on Twitter or Facebook. Thanks to PGUK Books who kindly sent me a copy of Marshmallow Madness to review, all opinions expressed are my own. Does it have veggie marshmallows in it? These look lovely! I have never thought of making marshmallows, and half the picture on the cover I'm not sure I'd even recognise as marshmallows! mmmmmmm, my mouth is watering.